The decade is the 1930s. The world is in an economic depression. Radio is just getting started and most people still get their news from newspapers. Some cities have a dozen or more papers with editions printing morning and evening. When really big news breaks an “extra” edition is rushed out at any time of the day. 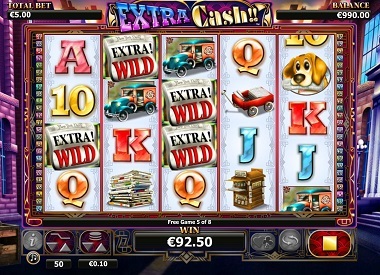 This is the world that NextGen Gaming chose to tap for its mobile slots game, Extra Cash!! It is so rare that a slot game theme is wholly original that Extra Cash!! just about merits its own special edition. Extra Cash!! is a five-reel slot game with 50 paylines. Like in the days of the penny press it only requires 0.01 coins to start the action with a maximum bet of 2.00 coins per line. There is no progressive jackpot with this progressive game. Extra Cash!! is set on a stylized downtown street of yore. The architecture is a mix of Classical Revival and Italianate styles, done up in bold Victorian hues. On the reels we have a vintage delivery van, a newsstand, a stack of papers, a trusty red wagon to haul the papers and an even trustier hound dog to fetch the papers. Our hero, the newsboy with a hounds tooth hat several sizes too big and an oversized sack, stands on a corner atop a wooden slat box announcing the arrival of the day’s news. The minor symbol playing cards are given a bold importance as well. The Extra! Wild Front Page is the Wild symbol and will substitute for all symbols except the Scatter in its quest to create winning combinations. It will also register on the pay table, bringing back 500X for a full win line of five Front Page Wilds. After every spin in basic play the Paperboy may fling a Front Page for an extra Wild on one of the three middle reels. The Read All About It feature involves the Scatter that is the word “Scatter” being printed through ink rolls. Three, four or five Scatters will award 8, 12 and 20 free games respectively. Any Wild that appears during the bonus round will stick around for all the Free Games that are left to be played. Plus, whenever two, three or four Scatters appear the Re-Spin Feature kicks in and the Scatter-less reels spin one more time in a push to bring more wins, scatters and free spins. The Read All About It feature is for one issue only – it will not be re-triggered. So stop the presses – this examination of yesterday’s news is so old it is new.